After some 100 km. I suddenly run out of gas. I simply hadn’t thought about the fact that the previous day we had driven almost 100 km. with two peersons on my bike. Bergie went looking for a gas station and I stayed at my bike waving for cars to stop. Finally a biker driving a car stopped. He didn’t speak any english but I managed to explain my problem. We didn’t have any proper hose to get the gas so he couldn’t help. Fortunately there was a gas station in 5 km. so Bergie returned soon. 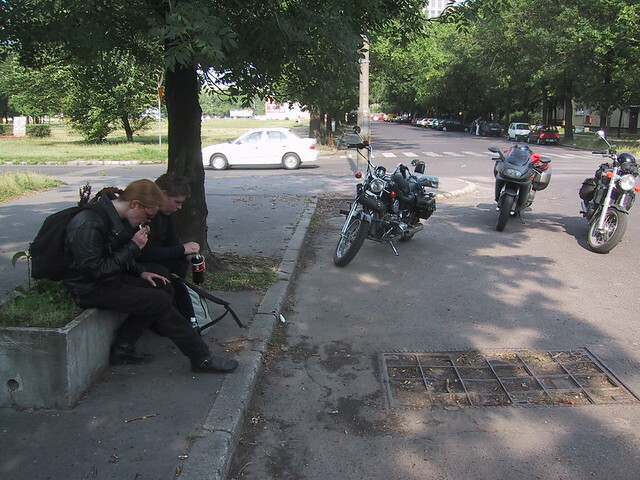 When I again had some gas to get me to the station, the guy - his name was Sergei - invited us to eat. He was just on his was to her mothrs with her wife and said we could also sleep there. We followed him for about 50 km. and arrived to a small village with cows and goats walking freely on the roads. When we started eating Sergei bought a bottle of vodka to the table and started filling our glasses. After having satisfied our stomaches the drinking continued. The memories past this point aren’t that clear anymore. I remember we drinked to Finland, to Ural, to Motorcycles and to Berenov - is that was the name of the village. Despite our language difficulties we managd to communicate without any major problems. At some point of the evening we also had a chat with some local young guys on small bikes and got invited to Sergeis sisters wedding in the beginning of August.. All together the three of us poured down two liters of vodka. Before going to sleep I had to go and throw up and so did Bergie during the night. When he was walking around the house they also mesured his blood pressure. All in all, the experience only made stronger our feeling about globall biker brotherhood.